We’ve released a new baxus access option – Targets. Now you can let your team view and track their personal targets while keeping your client and business information safe. Before you can choose what your staff can see, they’ll need to be given access to baxus. Just visit settings and create new users via the Staff & users tab. To learn more about creating new users, visit our support guide. Targets: Staff can view their own targets. 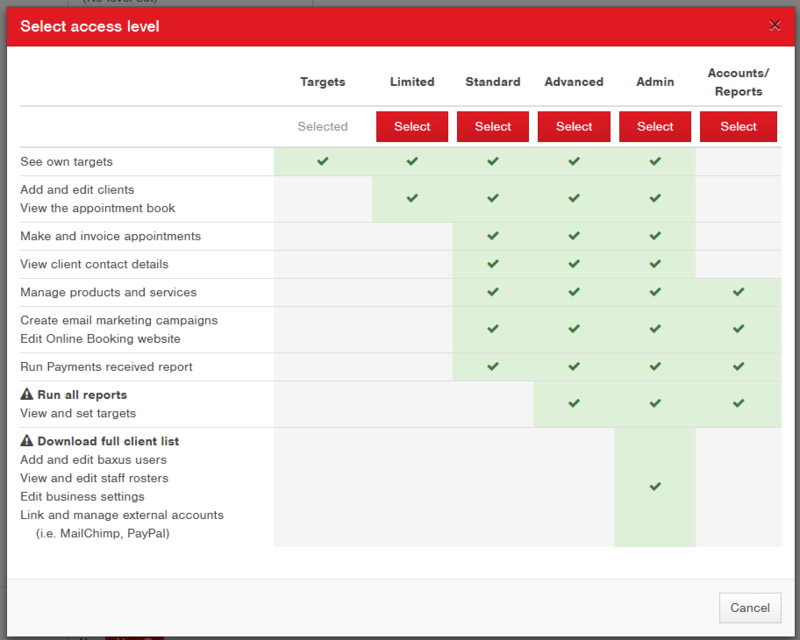 Limited : Targets + view the appointment book and add and edit client details. Standard: Limited + make and invoice appointments, manage products and services, create email marketing campaigns, edit Online Booking settings and run the payments received report. Advanced: Standard + run all reports and view and set targets. Admin: Advanced + download client lists, add and edit baxus users, view and edit staff rosters, edit business settings and manage accounts like MailChimp and PayPal. Accounts / Reports: Manage products and services, create email email marketing campaigns, edit Online Booking settings, run all reports and view and set targets.